Android Tablets in 12 Colors Just $58.99 + FREE Shipping (Reg. $270)! You are here: Home / Great Deals / Android Tablets in 12 Colors Just $58.99 + FREE Shipping (Reg. $270)! 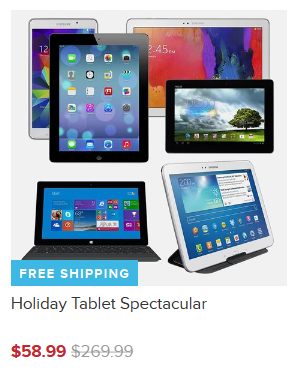 If you’ve been waiting for a great deal on a tablet or Ipad, you have got to check out this sale! Right now you can snag this Android Tablets in 12 Colors for just $58.99 + FREE Shipping (Reg. $270)! If you need something a little more powerful, they also have other tablets and iPads here, too!